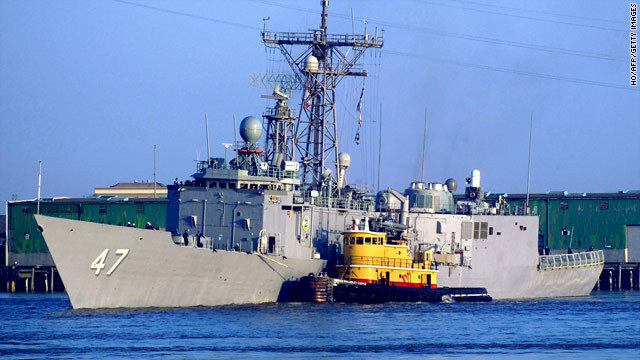 Five Somalis are accused of attacking the USS Nicholas in the Indian Ocean in 2010. (CNN) -- Five Somali men were sentenced Monday to life plus 80 years in prison for engaging in piracy and related offenses in last year's attack on a U.S. warship in the Indian Ocean, federal officials announced Monday. "Today marks the longest sentence ever given to a pirate in U.S. court, following the first time in over 190 years that an American jury has convicted a defendant of piracy," Neil H. MacBride, U.S. attorney for the Eastern District of Virginia, said in a statement. "Today's sentences should send a clear message to those who attempt to engage in piracy: Armed attacks on U.S.-flagged vessels carry severe consequences in U.S. courts." In November, a federal jury in Virginia convicted the Somali men -- Mohammed Modin Hasan, Gabul Abdullahi Ali, Abdi Wali Dire, Abdi Mohammed Gurewardher and Abdi Mohammed Umar -- of piracy, attack to plunder a vessel, act of violence against persons on a vessel, assault with a dangerous weapon, assault with a dangerous weapon on federal officers and employees, conspiracy to use firearms during a crime of violence, and multiple firearm counts, including the use of a rocket propelled grenade. Citing evidence and trial testimony, the statement said the five men left Somalia in three vessels -- two small ones and a larger one -- looking for a merchant ship to pirate. On April 1, 2010, Hasan, Ali and Dire boarded one of the smaller boats and set out to pirate what they believed to be a merchant ship, while Gurewardher and Umar remained on the large ship, the statement said. Using assault weapons and a rocket-propelled grenade, the men opened fire on what they later discovered was no merchant ship but the USS Nicholas, a 450-foot U.S. warship whose home port is in Norfolk, Virginia. The Nicholas, in turn, sank the boat that carried out the attack and captured the pirate mother ship that launched it. MacBride estimated that Somali pirates currently hold 650 to 800 people hostage and that the annual cost of piracy could reach $12 billion. That would include the costs of ransoms, military operations to provide protection to shipping lanes and insurance policies that cover piracy, he said. The sentencing occurred in Norfolk before Judge Mark Davis, MacBride said. He called the sentences, which do not include the possibility of parole, the longest ever given out to pirates. The pirate statute, which dates to the early years of this country, carries a mandatory life sentence. Pirate attacks have become a frequent hazard for sailors off Somalia, which has had no effective central government since 1991.